Wow, I can’t believe it’s already mid-January. I hope you’ve been refreshed and revived with the start of a New Year. I love the word, “new”. Don’t you? Today, I’m praising God for the newness of grace. I’ve really been pondering GRACE for the past few months. Perhaps because I’ve need so much of it lately. This morning, my mind travelled back to the day I met Rosa at an event in Mexico City. She stood in line for nearly an hour waiting for everyone to clear away. With the help of an interpreter, Rosa poured out her heart. Rosa was torn. Like her husband, she did not want this baby. Her marriage was in shambles, their finances were in a mess, and she was exhausted trying to keep up with the two little ones she already had. However, her religious convictions told her that abortion was wrong. The fear of living without her husband’s support drove Rosa to the abortion clinic. But before the procedure began, she changed her mind and ran from the building. Rosa broke down in sobs as I and the interpreter tried to comfort her. She had asked God to forgive her, and truly believed that He had. But she could not forgive herself. Rosa had believed the lie, but on that steamy July day, she learned to hold up her shield of faith and extinguish the fiery arrows. That day, Rosa chose to reject the devil’s lie and take hold of God’s truth. And the next day…and the next…and the next. How about you? Have you taken hold of that for which Christ Jesus has taken hold of you? Have you release the guilt of your past and embraced the grace of God? Don’t let the enemy taunt you with something God has already forgiven you for. Jesus gave His life so you could. 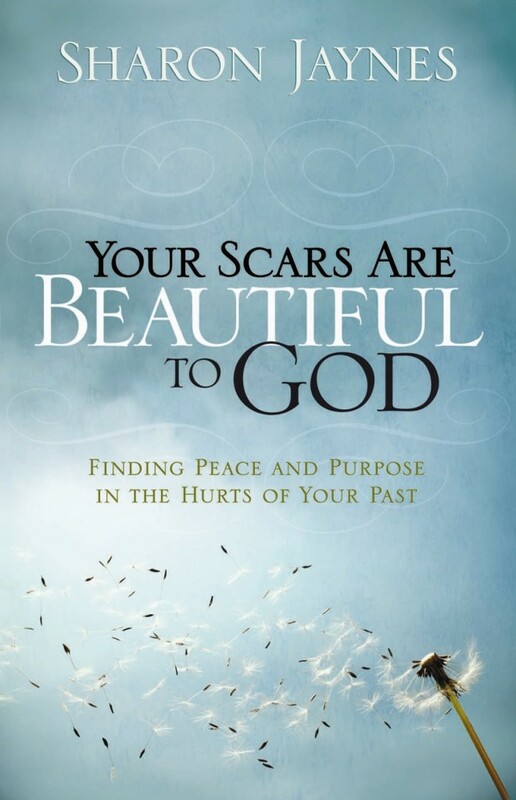 I’ll randomly pick one name from the comments and send a FREE copy of Your Scars are Beautiful to God: Finding Peace and Purpose in the Hurts of Your Past. Also, there’s a SALE going on over at www.localhost/sjold. Every book $10 until January 16, 2016. IM TAKING HOLD , God is my rock , he is my salvation , I VE been given authority over the enemy , I’m AM a child of the most high God , I am REDEEMED! I am set free , I love you lord , thank you for your sacrifice ! You are too good to me ! I am taking hold of Gods forgiveness, I am taking hold of His grace, this is a new day. Thankyou Lord for your mercy and grace. Praise God! I already have. Praise God, I already have! Praise God, I already have!! For many years I too, felt similar to Rosa, but for different reasons. Then, at a retreat, the point of being perfect in God was illustrated using a tree. A four-inch sapling was shown, and we were told that God had given it His love – the sunlight, the rain, nutrients…and it was a perfect tree. Then we were shown a foot tall sapling, it was also given the sunshine, the dew, the nutrition from the ground…It was perfect in God’s sight. A three foot tall little tree was brought in, God had given it the sunlight, the rain, the nutrients, and it was perfect in His sight. Then a seven-foot tree was brought in, and God had given it what all that He’d given the four-inch sapling… and it was perfect in His sight. I realized, it didn’t matter to the Lord if I was a new Christian or a mature Christian, I could be perfect in His sight just where I was. He loved me and gave me the sunlight, the rain, the nutrients to help me to grow, He wasn’t sparing the best of His love for those that were mature…He loves me too. Jesus loves ME. Me…. I am so grateful for that illustration several years back, I am grateful to know that I am important to Him every bit as much as you, as anyone else. Thank God He has enough love and forgiveness to go around for each one. And I am grateful that when I am growing, He will mature me into the fruit-bearing tree He has in mind for me to be….apple or cherry or peach, and I will not try to be a different kind of tree than what He plans. Thank you. God bless and keep each one. Christie, that is so beautiful. Thank you for sharing that illustration. I will carry that in my heart! I’d like to take hold but I’m so weak and broken and unworthy. I’m garbage. I’m so sad and hurt and just can’t see my way out. Gina: That is simply not true. You are God’s child. Don’t give up. I’m pulling for you. God always makes a way. Look for it. Seize it. You can do it one step at a time. Thank you, Sharon, for reminding me of God’s everlasting love and grace! Praise God, I already have! New mercies every morning. Praise God I already have. He carries all my burdens, so I may live free. Enjoy your blog…keep up the good work. This world needs you and the comfort you provide. Each day I am encouraged by your words. They are as if you’re talking directly to me. Praise God! I ready have! I am taking hold! Thank you Jesus! Praise the Lord! Relying on God today as I continue to let go of all guilt and shame. I’m taking hold! Praise God, I’m taking hold! Thank you for this devotion this morning. I am taking hold. I try so hard to remember that we have to begin every day asking God’s forgiveness and knowing that the forgiveness is granted. Like Rosa, I carry the guilt from wanting my pregnancy to go away. I never attempted abortion, but the emotion was there. Because of my guilt I have tried for over 40 years to make it up to my daughter. You can imagine what kind of relationship we have had because of this guilt. She has been able to manipulate me and I act on the guilt by giving her what she wants and trying to prove how much I love her. So in the end, my guilt has not hurt just me, but has also hurt my daughter. Just now I am beginning to establish boundaries that will help her to become more self-sufficient and less dependent on me. For those who can’t get rid of their guilt, be forewarned—it is a poison that will taint your every relationship. Let our precious Lord help you receive the forgiveness He intended when He was nailed to the cross. Our sins died there with Him. He triumphed over that death, and we should be able to triumph over our past sins knowing that His blood atoned for them if we only believe. Praise God! I already have! I choose daily not to let Satan slap those chains back on me. Praise God, I already have. Thank you for the message. I needed it this morning. When I feel battered and worn in the valley that’s when it’s easy to allow guilt and shame over the smallest of iniquities. But knowing that my sweet Lord has forgiven me but used all of it to make me His worthy to have a relationship with Jesus is amazing! On the flip side it forces me to love and forgive with His grace as well. Awesome devotion and so true. I take hold of Gods promise for forgiveness and I receive it in the name of Jesus. I am new and his grace and mercy is new every day. Be blessed Sharon and God grace and mercy be upon you as you carry the word out to his people. Praise God, I already have. My peace in my heart is the greatest. Struggles still come, but I get through them. Praise God! I already have! Thank You Lord for forgiveness, grace, new beginnings, hope, faith. For I know the plans I have for you, declares the Lord, plans to prosper you and not to harm you. Plans to give you a hope and a future. God, You sustain those You created! Praise God! My savior and stronghold ! I already have ! Thank you Jesus!!! Praise God I already have. And I continue to daily! I was a little torn as to which response would be mine, but I realized “Praise God” would be the right response. Yes there are things in my past that I am ashamed of, and things I don’t want to tell others of – they are private between God and me – but because of His forgiveness I don;t need to admit them to anyone else. However I don’t forget them. Just as we can forgive an abuser or gossip or some other offense against us that has brought harm and pain, we don’t then put ourselves back in a position with that person to be harmed or hurt again. We need to remember so we can learn from it. Praise God that He has made a way for us to get past our past. You go before me in each battle. And You are my rear guard. And You keep rescuing me and also, giving me skill, as I practice, with the weapons. As the song says, You are perfect in all of your ways! You’re a good good Father! It’s who You are!! And then life happens and I have to take hold! Thank you for sharing your journey and your faith. Satan loves to shame us and isolate us…the light we share with each other is such a blessing. A tangible piece of God’s grace in our day. Thank for such a powerful reminder of God’s amazing grace! I’m determined to let go! Both. Praise God, I already have. I’m taking hold!! trying to invade our minds and to constantly torment us. Thank you Sharon, I needed this! So glad! Praise God for the reminders! I need them too. “Praise God, I already have!, And continuing to do so on a daily basis! I’m taking hold. Please pray for me. Thank you for the reminder that if we ask forgiveness He does forgive us and we are free and to remind the devil he is a liar. I’m sort of between “Praise God, I already have” and “I’m taking hold.” Some areas of my past I’ve moved on in forgiveness, but still have a few lingering regrets that pick at my heart every now & then. With the power of the Holy Spirit, I will take hold of them & forgive myself. I’m in another valley. This one is a bit different. I know that I have been a good mother to this child , but still his actions and words display to him that I don’t care and love him and his wife. He is an adult with two kids, he parents very differently then his dad and I did. We displayed grace over and over to this child by showing him forgiveness and love . Saying no to an adult child is okay. Now if only my heart would only hear the Lord’s voice and not the enemy’s. Debbie: I will pray that you will listen to God’s voice and not the enemy. Setting boundaries is sooooo hard. But necessary. Praise God!! !….for hope, for peace, for new beginnings! Each day I will lean on God and praise him….for in Him, I am truly free! I already have! Praise God. Praise God I already have!!! Thank you for the C.S. Lewis quote…also Sharon I am sure you have heard about the program of take a word at the beginning of a New Year. Well, this year my word is “Grace”. it is so awesome …how the Lord has actively been working with my soul-mind-heart. My Adonai is mighty. HE cares. I’m taking hold! Again. Praise God! Praise God, I already have and THANK YOU JESUS. In Jesus name. I’m taking hold of forgiveness! My past has haunted me long enough ! Praise God, I have already. I already have !! But, I did not accept it at first until like your story, my husband said to me, “Do you believe i God?” Yes was my reply. He said, “Well, if you believe and you know that Jesus died on that cross, then what you are saying is that He did it for everyone else but you”. That hit me between the eyes. I accepted and struggled for a while with the enemies lies but he finally got tired of trying to make me pick up those guilt chains again. Thank you for reminding e of how far i have come, BECAUSE OF HIM! Praise God I already have. Praise God I am forgiven! Oh Lynn. I bet if the people you teach knew, your teaching would go to a whole other level. The devil wants you to keep it to yourself, but the moment you share it, let people know how God got you through it and forgave you, the devil has lost. He will do everything he can to keep you from sharing it. If you would like to chat more, you can email me at sharon@localhost/sjold. I am taking hold! God is good all the time! I am glad to be a child of the King. I’m taking hold! God is always in my side that no matter how difficult my situation right now God will reveal his words to me and provide me a happeness. My Husband and I is temporarily separated but because we have to see the whole family we pretend we’re getting better. His kids and his brother know what happening right now on us. I felt so sad, lots of fear because we are at the place of my husband family thinking how they will act in front of me. The feeling of unconfortable, worry of what thier thinking on me is always on my mind. But I learn to trust God and when I feel so down I try to close my eyes and soak my my mind in God words and it really helping me a lot. I can’t to go home and hide. Pls. Help and pray for me for my marriage restoration. I am taking hold! This is exactly where i am right now! God has been very gentle and patient with me in over coming my disbelief. God is good all the time! I’m taking hold on this day. Thank you for letting me see that God has already forgiven me. I am taking hold. Praise God, I already have! Today I am taking hold of Gods forgiveness. When my first born died of a rare cancer, I secretly believed that God was punishing ME for past mistakes/behavior. Now I know that was the lie that Satan would like me to believe. I accept Christ as my Lord and Savior! Thank God from who all blessings flow! Praise God!! I already have. With the teaching and verses that I got from you Sharon its a Blessing to me and my family. Thank you so much. Please Sharon could you mail me again like before those Girlfriends in God. Everyday family issues that may not be everyday for usual family members seemed to have cursed my family, I am constantly renewing my faith in God and rebuking the Devils hold on my daughter. I repent everyday because the devil has convinced me that I am the cause of her problems. Her problems have engulfed our entire family. Some days I can’t see an end to the insanity. Some days I feel the peace of God but most days I don’t, it’s a constant strugle. I am holding on! I’ve held such a burden for so long, and this made me realize …God forgives me and if HE forgives me then I need to forgive myself! I feel a sense of relief within….it all makes sense. Amen! Let it go, dear one. God has. It is the enemy who keeps bringing it up! Im letting go and letting Go. Through him all things are possible. Thank you Sharon for this beautiful story yes I have felt the way rosa felt but for other reasons god has forgiven me..
I’m taking hold! I’ve held onto so much that the devil has robbed me of what GOD has offered me, Grace,Hope and Love……I say Not Anymore! Thank You for all you do in and for Christ our Lord! I’m so proud of you. As a mom myself, I know she wouldn’t want you to let whatever it was to hold you down. Praise be to God!!! He IS my redeemer!! and takes away all of my sins and past mistakes!! AND FORGIVES ME!! and tells me it’s ok to forgive myself!! I will ALWAYS look to him first!! I love you Lord!! ALL BECAUSE JESUS DIDN’T THROW THE CLAY AWAY! SO THANKFUL GOD IS NOT THROUGH WITH ME YET AND THAT HE DOESN’T THROW US AWAY BECAUSE OF OUR IMPERFECTIONS! Praise God I already have!!! I had done something way back, that was not according to Gods will. Like Rosa, I took years to forgive myself & to realise Jesus had forgiven me, & I was set free of that which I had done. Thank you Jesus… So I moved on, & to this day I continue in my walk with the Lord, in is wonderful grace.. Yes thank you Jesus. I have sinned numerous times over my 52 years and I regret those times. I can not change what I did in the past but I can work on changing the present and the future. God has forgiven me for the wrongs I have done and I need to forgive myself as well. Papa God…I already have. I give you the Honor and Glory which you so richly deserve! Amen and Amen.